The third version of the ghorfa was completed in 2007. This time, it was an interactive version that reacted to the state of concentration of the person inside. The nature of this ghorfa responded in particular to the context in which it was made. 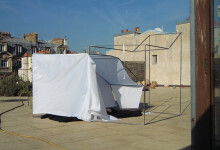 Produced and exhibited at Synesthesie in Saint-Denis, an organization and exhibition space that specializes in virtual and multimedia art, the ghorfa is cybernetic and constructed with materials produced by new technology. 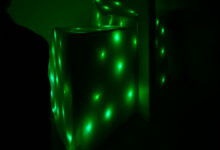 Entirely made of fabric, it is composed of an interior and an exterior layer that house a sophisticated electronic system made with ninety-nine luminous green diodes and motion sensors. The inside layer is made with opaque fabric that plunges the viewer sitting inside in complete darkness, while allowing the light from the diodes to diffuse in the exhibition space. The viewer is invited to enter the ghorfa and to sit on a small cushion on the floor. Nothing else is inside but her, sitting in the darkness, here and now. But the viewer’s state of concentration, her progressive calm, is visible through the illumination of the ninety-nine green diodes emitted from the interior wall of the ghorfa. The less the viewer moves, the more the light intensifies, thus materializing her state of tranquility for the viewers outside.